"In a very constructive way, Dr. Sue provides time-tested psychological suggestions to make our society free of microaggressions. It is a brilliant resource and ideal teaching tool for all those who wish to alter the forces that promote pain for people." "Microaggressions in Everyday Life offers an insightful, scholarly, and thought-provoking analysis of the existence of subtle, often unintentional biases, and their profound impact on members of traditionally disadvantaged groups. The concept of microaggressions is one of the most important developments in the study of intergroup relations over the past decade, and this volume is the definitive source on the topic." "Derald Wing Sue has written a must-read book for anyone who deals with diversity at any level. Microaggressions in Everyday Life will bring great rewards in understanding and awareness along with practical guides to put them to good use." "This is a major contribution to the multicultural discourse and to understanding the myriad ways that discrimination can be represented and its insidious effects. Accessible and well documented, it is a pleasure to read." 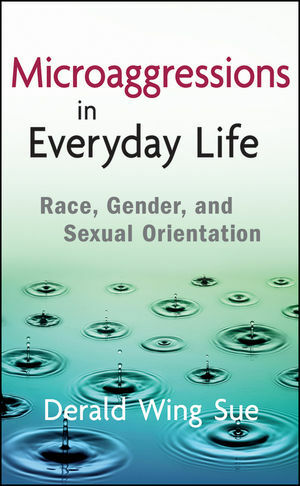 Written by bestselling author Derald Wing Sue, Microaggressions in Everyday Life: Race, Gender, and Sexual Orientation is a first-of-its-kind guide on the subject of microaggressions. This book insightfully looks at the various kinds of microaggressions and their psychological effects on both perpetrators and their targets. Thought provoking and timely, Dr. Sue suggests realistic and optimistic guidance for combating—and ending—microaggressions in our society. Derald Wing Sue, PhD, is a Professor of Psychology and Education in the Department of Counseling and Clinical Psychology at Teachers College, Columbia University, and he also holds a joint appointment with the School of Social Work. Coauthor of the bestselling Counseling the Culturally Diverse, Fifth Edition, he is one of the most cited multicultural scholars in the United States. SECTION ONE: PSYCHOLOGICAL MANIFESTATION AND DYNAMICS OF MICROAGGRESSIONS. CHAPTER ONE: The Manifestation of Racial, Gender, and Sexual-Orientation Microaggressions. CHAPTER TWO: Taxonomy of Microaggressions. CHAPTER THREE: The Psychological Dilemmas and Dynamics of Microaggressions. SECTION TWO: MICROAGGRESSIVE IMPACT ON TARGETS AND PERPETRATORS. CHAPTER FOUR: The Microaggression Process Model: From Beginning to End. CHAPTER FIVE: Microaggressive Stress: Impact on Physical and Mental Health. CHAPTER SIX: Microaggressive Perpetrators and Oppression: The Nature of the Beast. SECTION THREE: GROUP-SPECIFIC MICROAGGRESSIONS: RACE, GENDER, AND SEXUAL ORIENTATION. CHAPTER SEVEN: Racial/Ethnic Microaggressions and Racism. CHAPTER EIGHT: Gender Microaggressions and Sexism. CHAPTER NINE: Sexual-Orientation Microaggressions and Heterosexism. SECTION FOUR: MICROAGGRESSIONS IN EMPLOYMENT, EDUCATION, AND MENTAL HEALTH PRACTICE. CHAPTER TEN: Microaggressive Impact in the Workplace and Employment. CHAPTER ELEVEN: Microaggressive Impact on Education and Teaching: Facilitating Diffi cult Dialogues on Race in the Classroom. CHAPTER TWELVE: Microaggressive Impact on Mental Health Practice.